You searched for which does not fit your . We've redirected you to 724-779, which has the proper fitment. So far, so good. Good fit, style and plenty of pockets. My last Harley brand jacket lasted 40 years. We'll see how this one holds up in the long run. But very satisfied at this time! And EXCELLENT customer service. Thanks! Get fit and quality jacket. This is an excellent coat. The zip out liner is great when the temps rise and very easy to reinstall later in the evening when the temps cool. Very well made coat. Wear it most of the year. Summer it's too hot and I wear a perforated riding jacket. this is a top quality jacket especially for the price. it is a winter jacket only and would be too heavy for summer use. the size is true to size so if it does not fit, you got bigger. it is heavy stitched with a heavy zipper. I have been looking for a jacket to replace the expensive one I out grew and this is the same quality as the one it replaced with being one third the cost. also this comes in REG and Tall versions, I made a mistake with this and they took the REG back with no problems. WOW!! for the price, the quality can't be beat. This jacket rivals those that cost 3 times more. Very thick leather, well built and heavy. Order next size up to make sure you get the right fit. Lots of room for the shoulders if you lean forward or stretch your arms out when riding, sleeves long enough as well so that they don't ride up to your forearm, lots of flex/room in the shoulder area and does not tighten up going around your back to allow freedom of movement. Inner liner can be removed easily as well. If you like the style, you can't go wrong with this jacket. 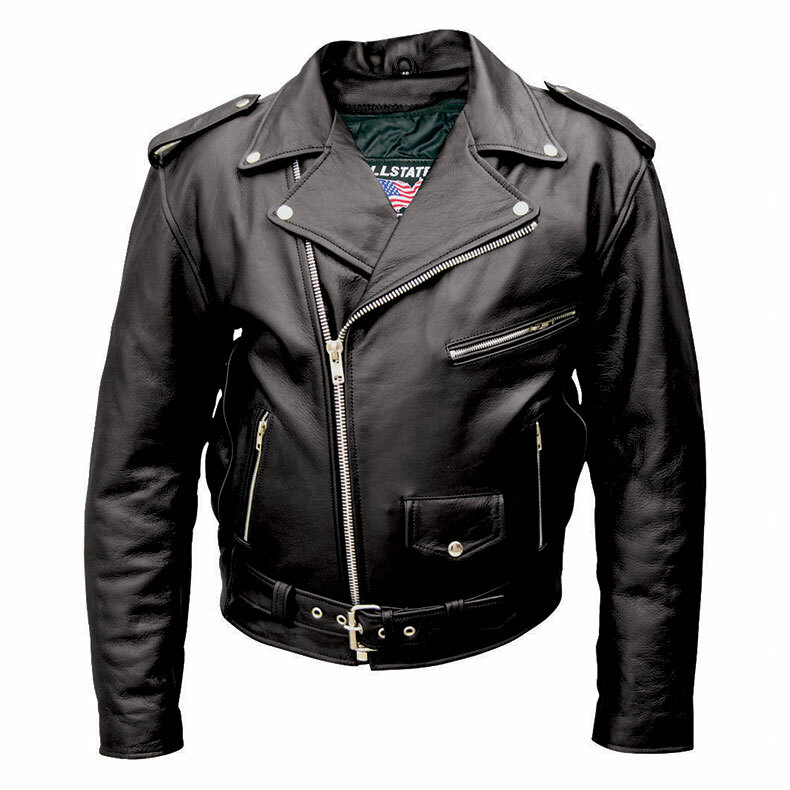 Release your Eric Von Zipper or Brando Wild One personality in this jacket. You just can't go wrong buying this one!!! This is a very heavy jacket. The lining zips out which is nice. With wear it will break in and give many years of use. The price cannot be beat. J&P's service was fantastic. Not being able to try it on, they returned and shipped another until the correct size was found. It took three jackets. Normally I wear a 44 long. The 50 was too large and the 46 to tight. I am tall and only medium build. I bought this jacket to leave at another house. It will be great flying without heavy jacket. Great jacket for the money and J & P went beyond in service. Great fit and outstanding quality for a fantastic price! !